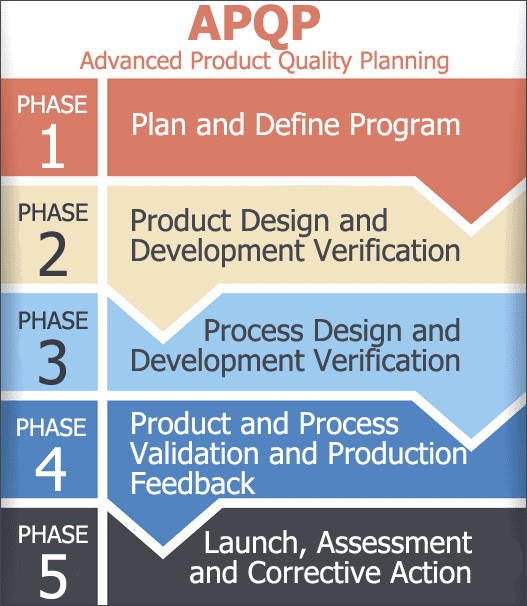 Advanced Product Quality Planning, or APQP for short, creates a roadmap for developing new products complete with time-based milestones and decision points along the way. A major objective of APQP is to provide a vehicle for suppliers and customers to work together when developing a new product. A comprehensive APQP helps assure that the product is delivered on time and with the highest added-value. New Product Introductions (NPIs) have a greater success rate when the principles of the APQP approach are followed. APQP has five formal phases. Each phase is connected to and triggers the next. APQP is not a “use what I like and ignore the rest” approach. It represents a continuum in which each phase builds upon the next. APQP was introduced in 1994 by the AIAG or Automotive Industry Action Group. Before then, the requirements of OEMs (in the automotive sector) were at times confusing and conflicting. APQP provided a common platform for planning, developing and producing a product or providing a service. The original 1994 version of APQP was a collaborative effort involving Chrysler Corporation, Ford Motor Company and General Motors Corporation. In the intervening years, AIAG membership has grown to include OEMs such as Caterpillar, Daimler, Honda, International Truck, Nissan, Toyota and many automotive sector part suppliers and service suppliers. Today, the use of APQP has extended to many organizations beyond the automotive sector.